Cambridge Scientific Abstracts, USA; Materials Information, USA; ISI SciSearch/Research Alert/Materials Science Citation Index; Scopus. Lasers in Engineering publishes original (primary) research articles, reviews, short communications and letters on all aspects relating to the application of lasers in the many different branches of engineering and related disciplines. The topics covered by Lasers in Engineering are the use of lasers: in sensors or measuring and for mapping devices; in electrocomponent fabrication; for materials processing; as integral parts of production assemblies; within the fields of biotechnology and bioengineering; in micro- and nanofabrication; as well as the materials and processing aspects of techniques such as cutting, drilling, marking, cladding, additive manufacturing (AM), alloying, welding and surface treatment and engineering. Lasers in Engineering presents a balanced account of future developments, fundamental aspects and industrial innovations driven by the deployment of lasers. Modern technology has a vitally important role to play in meeting the increasingly stringent demands made on material and production systems. Lasers in Engineering provides a readily accessible medium for the rapid reporting of new knowledge, and technological and scientific advances in these areas. 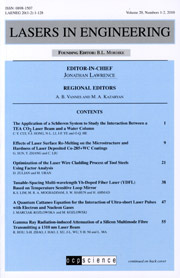 Papers concerning scientific aspects; fundamental theory; and mathematical and analytical analysis methods surrounding lasers, laser beams and laser beam interactions and applications should be submitted to the International Journal of Laser Science: Fundamental Theory and Analytical Methods; which provides complementary cover in these topic areas to Lasers in Engineering. The editors of Lasers in Engineering invite your contributions.